Modifications: I added an extra couple of inches to the sleeves, and only made one buttonhole. 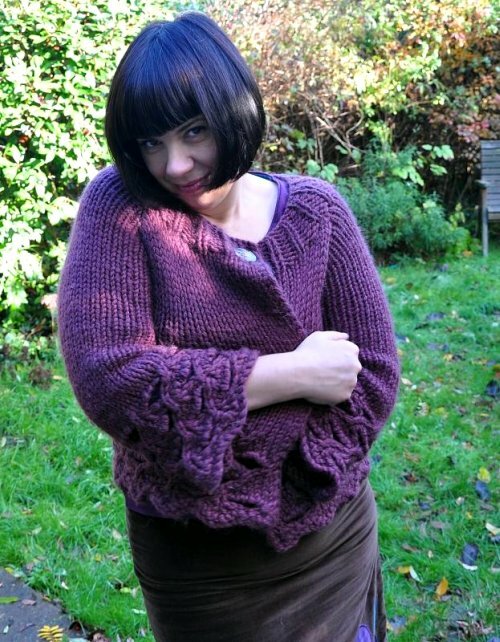 I think this shape of cardigan falls best on my shape when it is just fastened at the top. It also meant that I could use this gorgeous vintage Dixie Nichols button, which has been waiting for a suitable project. Notes: This is a wonderfully cosy cardigan, which I have worn loads since finishing. To be honest though, I don’t think it is the most amazingly flattering garment for me. The bulky wool, and the boxy shape do make me look rather more bulky and boxy than I actually am. But it is lovely to wear on these chilly autumn days. Love the colour and the button. Oh so cosy and cute – and that button is particularly fine. Just catching up with a welcome to Ruby with her amazing hair and a gorgeous wee outfit and I’m glad your friends had a lovely wedding and the bolero was beautiful. I love it! 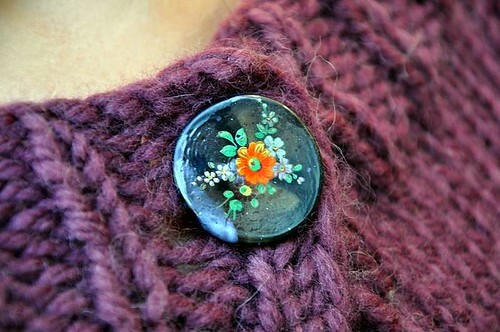 You look so cosy and warm and that’s the perfect use for a very beautiful button. I always admire DN buttons but often wonder what I would do with them without them making a finished garment look too busy, but using a single one to fasten a cardigan is the perfect solution. The light in those photos is gorgeous, too. Beautiful color and looks very cozy for this winter. 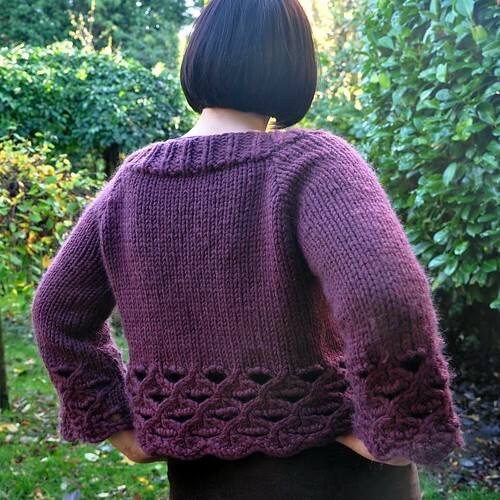 What a gorgeous cardi! I love the colour, the chunky texture, the shape, everything! I know what you mean about boxy shaped, but I think it really suits you. Oooh! That colour is gorgeous on you! And it looks so comfy and soft! I see what you mean about the shape, but I think you can work it. It’s wonderful and looks so nice on you – not bulky or boxy at all! It’s the perfect color for you, too! Great pattern and I think it looks great on you too – and the colour is superb! Its such a lovely colour and the button is perfect! Oh I love it, it’s gorgeous. It’s worked out really well, and especially with that amazing yarn! Thanks also for your lovely email. It’s always great to ‘meet’ fellow knitters :-). that is gorgeous Anna! I love the color so much…even the name of it is pretty. (mulberry) I’ve not seen that pattern before and I really like it. Great job!! Such a beautiful color, and you look so pretty in it! i can see why you might think it’s not perfect on you but I don’t think it’s overly boxy or bulky! I steer away from bulky knits for that reason but at some point in winter I’m really happy to be wearing something warm and heavy so I don’t mind them – no one expects us to look svelte in layers!! But that colour – wow. Gorgeous. And I do so love your hair. Gorgeous sweater – I love the color, and the button! It is boxy, but it really looks nice on you. It looks so warm! 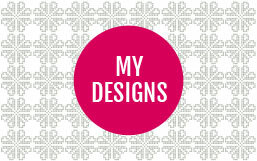 I love the button. it looks gorgeous! i love the colour and the button is amazing. enjoy! Your Tess looks fantastic on you! I was just looking through this pattern book last night and was wondering whether I ought to give that pattern a whirl…. Now I just have to!